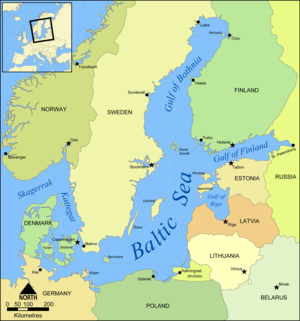 The Baltic Sea is located in Northern Europe, from 53°N to 66°N latitude and from 20°E to 26°E longitude. It is bounded by the Scandinavian Peninsula, the mainland of Northern Europe, Eastern Europe and Central Europe, and the Danish islands. It drains into the Kattegat by way of the Öresund, the Great Belt and the Little Belt. The Kattegat continues through the Skagerrak into the North Sea and the Atlantic Ocean. The Baltic Sea is artificially linked to the White Sea by the White Sea Canal and to the North Sea by the Kiel Canal. The first to name it the Baltic Sea ("Mare Balticum") was 11th century German chronicler Adam of Bremen. The origin of the name is speculative. He may have based it on the mythical North European island Baltia, mentioned by Xenophon. Another possibility is that Adam of Bremen connected to the Germanic word belt, a name used for some of the Danish straits, while others claim it to be derived from Latin balteus (belt).. Still another proposed derivation from the Indo-European root *bhel meaning white, shining (note that 'baltas' means 'white' in today's Lithuanian language, for example). The latter name could have influenced the Baltica myth because Baltic tribes lived on the shores of the Baltic Sea in ancient times and had contacts with the Mediterranean civilisations being a well-known source of amber for ancient Greece and later for the Roman Empire. However it is indisputable that the source of the name for the Baltic countries is the name of the Baltic Sea, not the other way around. In Germanic languages, except English, East Sea is used: Danish (Østersøen), Dutch (Oostzee), German (Ostsee), Norwegian (Østersjøen), and Swedish (Östersjön); in addition, Finnish, a Balto-Finnic language has calqued the Swedish term as Itämeri, disregarding the geography; the sea is west of Finland. In another Balto-Finnic language, Estonian, it is called the West Sea (Läänemeri). The Baltic Sea is a brackish inland sea, the largest body of brackish water in the world. The fact that it does not come from the collision of plates, but is a glacially scoured river valley, accounts for its relative shallowness. The Baltic sea is about 1610 km (1000 miles) long, an average of 193 km (120 mi) wide, and an average of 55 m (180 ft, 30 fathoms) deep. The maximum depth is 459 m (1506 ft), on the Swedish side of the centre. The surface area is about 377,000 km² (145,522 sq mi) and the volume is about 21,000 cubic km (3129 cubic miles). The periphery amounts to about 8000 km (4968 miles) of coastline. These figures are somewhat variable because a number of different estimates have been made. As a long-term average the Baltic Sea is ice covered for about 45% of its surface area at maximum annually. The ice-covered area during such a normal winter includes the Gulf of Bothnia, the Gulf of Finland, Gulf of Riga and Vainameri in the Estonian archipelago. The Baltic Proper does not freeze during a normal winter, with the exception of sheltered bays and shallow lagoons such as the Courland Lagoon). The ice reaches its maximum extent in February or March; typical ice thickness in the northernmost areas in the Bothnian Bay is about 70 cm for landfast sea ice. The thickness decreases when moving south. Freezing begins in the northern coast of Gulf of Bothnia typically in early November, reaching the open waters of Bay of Bothnia, the northern basin of the Gulf of Bothnia, in early January. The Bothnian Sea, the basin south of it, freezes on average in late February. The Gulf of Finland and the Gulf of Riga freeze typically in late January. The ice extent depends on whether the winter is mild, moderate or severe. Severe winters can ice the regions around Denmark and southern Sweden, and on rare cases the whole sea is frozen, such as in 1942. In 1987 some 96% of the Baltic Sea was iced, leaving only a small patch of open water to the west of Bornholm in the Baltic proper. Contrary to this, in milder winters the Bay of Bothnia and Gulf of Finland are the only larger areas that are ice covered, in addition to coastal fringes in more southerly locations such as the Gulf of Riga. During winter, fast ice which is attached to the shoreline, develops first, rendering the ports unusable without the services of icebreakers. Level ice, ice sludge, pancake ice or rafter ice form in the more open regions. The gleaming expanse of ice is similar to the Arctic, with wind-driven pack ice and ridges up to 15 m, and was noted by the ancients. Offshore of the landfast ice the ice remains very dynamic all year, because of its thickness it is relatively easily moved around by winds and therefore makes up large ridges and pile up against the landfast ice and shores. The ice cover is the main habitat only for a few larger species. The largest of them are the seals that both feed and breed on the ice. Although the sea ice also harbors several species of algae that live in the bottom and inside brine pockets in the ice. The difference between the outflow and the inflow comes entirely from fresh water. More than 250 streams drain a basin of about 1.6 million square km, contributing a volume of 660 cubic km per year to the Baltic. They include the major rivers of north Europe, such as the Oder, the Vistula, the Neman, the Daugava and the Neva. Some of this water is polluted. Additional fresh water comes from the difference of precipitation less evaporation, which is positive. The Baltic Sea's salinity is much lower than that of ocean water (which averages 3.5%, or 35 parts per thousand), as a result of abundant freshwater runoff from the surrounding land; indeed, runoff contributes roughly 1/40th its total volume. (Alhonen 88) It varies from 0.1% in the north to 0.6-0.8% in the centre. Below 40-70 m, it can be as much as 1.5-2.0%. The flow of fresh water into the sea from rivers and the flow of salty from the South builds up a gradient of salinity in the Baltic Sea. Near the Danish straits the salinity is close to that of the North Sea. The salinity steadily decreases towards North and East. At the bottom of the Gulf of Bothnia the water no longer tastes salty and many fresh water species live in the sea. 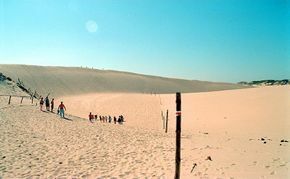 The salinity gradient is paralleled by a temperature gradient. These two factors limit many species of animals and plants to a relatively narrow region of Baltic Sea. The most saline water remains on the bottom, creating a barrier to the exchange of oxygen and nutrients, fostering totally different maritime environments. The land is still emerging from its subsident state, which was caused by the weight of the last glaciation. Consequently, the surface area and the depth of the sea are diminishing. The uplift is about eight millimetres per year on the Finnish coast of the northernmost Gulf of Bothnia . The northern part of the Baltic Sea is known as the Gulf of Bothnia, of which the northernmost part is the Bay of Bothnia or Bothnian Bay. The more rounded southern basin of the gulf is called Bothnian Sea and immediately to the south of it lies the Sea of Åland. The Gulf of Finland connects the Baltic Sea with St Petersburg. The Gulf of Riga lies between the Latvian capital city of Riga and the Estonian island of Saaremaa. In the south, the Bay of Gdańsk lies east of the Hel peninsula on the Polish coast and west of Sambia in Kaliningrad Oblast. The Bay of Pomerania lies north of the islands of Usedom and Wolin, east of Rügen. Between Falster and the German coast lie the Bay of Mecklenburg and Bay of Lübeck. The westernmost part of the Baltic Sea is the Bay of Kiel. The three Danish straits, the Great Belt, the Little Belt and The Sound (Öresund), connect the Baltic Sea with the Kattegat bay and Skagerrak strait in the North Sea. The confluence of these two seas at Skagen on the northern tip of Denmark is a visual spectacle visited by many tourists each year. About 85 million people live in the Baltic drainage basin, 15 million within 10 km of the coast and 29 million within 50 km of the coast. Around 22 million live in population centers of over 250,000 . 90% of these are concentrated in the 10 km band around the coast. Of the nations containing all or part of the basin, Poland includes 45% of the 85 million, Russia 12%, Sweden 10% and the others (see below) less than 6% each. The Baltic Sea somewhat resembles a riverbed, with two tributaries, the Gulf of Finland and Gulf of Bothnia. Geological surveys show that there was a river in the area prior to the Pleistocene: the Eridanos. Several glaciation episodes during the Pleistocene scooped out the river bed into the sea basin. By the time of the last, or Eemian interglacial ( MIS 5e), the Eemian sea was in place. From that time the waters underwent a geologic history summarized under the names listed below. Many of the stages are named after marine animals (e.g., the Littorina mollusk) that are clear markers of changing water temperatures and salinity. The factors that determined the sea’s characteristics were the submergence or emergence of the region due to the weight of ice and subsequent isostatic readjustment, and the connecting channels it found to the North Sea-Atlantic, either through the straits of Denmark or at what are now the large lakes of Sweden, and the White Sea- Arctic Sea. In the early Middle Ages, Vikings of Scandinavia fought for control over the sea with Slavic Pomeranians. The Vikings used the rivers of Russia for trade routes, finding their way eventually to the Black Sea and southern Russia. Lands next to the sea's eastern shore were among the last in Europe to be converted into Christianity in the Northern Crusades: Finland in the 12th century by the Swedes, and what are now Estonia and Latvia in the early 13th century by the Danes and the Germans ( Livonian Brothers of the Sword). The powerful German Teutonic Knights gained control over most of the southern and eastern shore of the Baltic Sea, while fighting the Poles, the Danes, the Swedes, the Russians of ancient Novgorod, and the Lithuanians (latest of all Europeans to convert to Christianity). Later, the strongest economic force in Northern Europe became the Hanseatic league, which used the Baltic Sea to establish trade routes between its member cities. In the 16th and early 17th centuries, Poland, Denmark and Sweden fought wars for Dominium Maris Baltici (Ruling over the Baltic Sea). Eventually, it was the Swedish Empire that virtually encompassed the Baltic Sea. In Sweden the sea was then referred to as Mare Nostrum Balticum (Our Baltic Sea). In the 18th century Russia and Prussia became the leading powers over the sea. Russia's Peter the Great saw the strategic importance of the Baltic and decided to found his new capital, St Petersburg at the mouth of the Neva river at the east end of the Gulf of Finland. There was much trading not just within the Baltic region but also with the North Sea region, especially eastern England and the Netherlands: their fleets needed the Baltic timber, tar, flax and hemp. During the Crimean War a joint fleet of Britain and France attacked the Russian fortresses by bombarding Sveaborg, which guards Helsinki, and Kronstadt, which guards St Petersburg, and destroying Bomarsund in the Åland Islands. After the unification of Germany in 1871, the whole southern coast became German. The First World War was partly fought in the Baltic Sea. After 1920 Poland returned to the Baltic Sea, and the Polish ports of Gdynia and Gdańsk became leading ports of the Baltic. During the Second World War Germany reclaimed all of the southern shore and much of the eastern by occupying Poland and the Baltic states. In 1945 the Baltic Sea became a mass grave for drowned people on torpedoed refugee ships. As of 2004, the sinking of the Wilhelm Gustloff remains the worst maritime disaster, killing (very roughly) 9,000 people. In 2005, a Russian group of scientists found over 5,000 airplane wrecks, sunken warships, etc., mainly from the Second World War, lying at the bottom of the sea. After 1945 the sea was a border between opposing military blocks: in the case of military conflict in Germany, in parallel with a Soviet offensive towards the Atlantic Ocean, communist Poland's fleet was prepared to invade the Danish isles. In May 2004 the Baltic Sea became almost completely a European Union internal sea when the Baltic states and Poland became parts of the European Union, leaving only the Russian metropolis of St Petersburg and the exclave of Kaliningrad Oblast as non-EU areas. The Baltic Sea starts to get very rough with the October storms. These winter storms have been the cause of many shipwrecks, for example, the sinking of the ferry M/S Estonia en route from Tallinn, Estonia to Stockholm, Sweden in 1994, which claimed the lives of hundreds. But thanks to the cold brackish water where the shipworm cannot survive, the sea is a time capsule for centuries-old shipwrecks. Perhaps the most famous one is the Vasa. Approximately 100,000 square km of the seafloor (¼ of the total area) is a variable dead zone. The more saline (and therefore denser) water remains on the bottom, isolating it from surface waters and the atmosphere. This leads to decreased oxygen concentrations within the zone. It is mainly bacteria that grow in it, digesting organic material and releasing hydrogen sulfide. Because of this large anaerobic zone, the seafloor ecology differs from that of the neighbouring Atlantic. Construction of the Great Belt Bridge ( 1997) and Oresund Bridge ( 1999) over the international waterway of the Danish Straits has limited the Baltic Sea to medium-sized vessels. The Baltic Sea is the main trade route for export of Russian oil. Many of the neighboring countries are concerned about this, since a major oil leak would be disastrous in the Baltic given the slow exchange of water and the many unique species. The tourism industries, especially in economies dependent on tourism like northeastern Germany, are naturally very concerned. Shipbuilding is practiced in many large shipyards around the Baltic: Gdańsk, Szczecin in Poland, HDW in Kiel, Germany, Karlskrona and Kockums in Malmö, Sweden, and Rauma, Turku, Helsinki in Finland, Rīga, Liepāja in Latvia and Klaipėda in Lithuania. There are several cargo and passenger ferry operators on the Baltic Sea, such as Silja Line, Polferries, Viking Line, Tallink and Superfast Ferries.